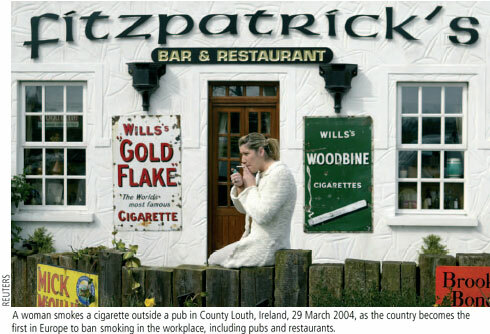 Ireland became the first country in the world to prohibit smoking in the workplace on 29 March 2004. The ban amounts to tobacco-free environments in all enclosed public spaces  including restaurants and the country's famous pubs, where a cigarette and a pint of stout have long been traditional habits. "It's an important accomplishment, and it sends a good, strong message to the rest of the world," said Vera da Costa e Silva, Director of WHO's Tobacco-Free Initiative. Much of the media coverage of the ban has focused on disgruntled pub proprietors and patrons. Although 30% of the Irish population currently smoke, few have formally objected to or violated the ban since it was enacted, said Valerie Coghlan, administrator of the Irish branch of Action on Smoking and Health, a London-based advocacy group whose mission is to eliminate smoking in society. The ban was announced just four days after Ecuador and The Republic of Congo signed the WHO Framework Convention on Tobacco Control, bringing the total number of participating countries to 100 and the total number of signatories to 101, including the European Community. Negotiated worldwide under the auspices of WHO, this convention is the first legal instrument designed to reduce tobacco-related deaths and disease around the world. It obliges signatories to meet minimum standards on tobacco-related issues such as cigarette advertising, protection from second-hand smoke, tax and price measures, as well as packaging and labeling. The convention is the centrepiece of an overall effort by WHO to shift views on smoking, according to da Costa e Silva. "We now have clear evidence that nicotine addiction is a disease. Therefore, smoking should be treated as a preventable and treatable epidemic," she said. It is an epidemic that is expanding rapidly. Barring more effective intervention, the total number of tobacco users is expected to rise from the current 1.3 billion to 1.7 billion by 2025. Tobacco use now kills 4.9 million people each year, with the heaviest toll in developing countries, where 7 out of 10 smoking-related deaths occur. Experience suggests the measure taken by Ireland could turn out to be the simplest and most effective way to discourage smoking and encourage cessation. "In enacting a workplace ban, you send a message: 'We want you to live in a healthy environment.' That message creates a supportive atmosphere for smokers to quit, especially if you offer them help," da Costa e Silva said. Ireland's Government prepared for the ban by concurrently bolstering smoking cessation programmes, Coghlan said. "We now have a national hotline for smokers wanting to quit, and many of our pharmacists have completed a training program to become special advisors. There are big posters everywhere alerting people about how to get help, and they are responding." A workplace ban is a major step toward protecting the public against passive smoking, which puts adults at risk of lung cancer and children at risk of respiratory infections and asthma, according to the US Environmental Protection Agency. Research also has shown that reduced exposure to passive smoking decreases acute cardiac events. In one striking study, presented at an American College of Cardiology conference in March, researchers reported a 60% drop in heart attack admissions at local hospitals during a six-month temporary smoking ban in public buildings in Helena, Montana, a city with a population of 65 000 in western US. Ireland's choice of a workplace ban was inspired, said Haik Nicogosian, Regional Advisor for Europe at WHO, because it shifts the public's focus away from the right of people to do as they please in restaurants and bars, which has been at the centre of the debate. "Now the focus is on to the rights of workers, and not the rights of customers, to be in a smoke-free environment. It is a more winning approach," he said. To date only a few countries have experimented seriously with smoking bans. The US has piecemeal local regulations on indoor smoking, in New York City  a pioneer in anti-smoking legislation  and Boston, for example. A number of countries  including Egypt, the Republic of Korea, the United Republic of Tanzania, Thailand and Uganda  forbid smoking in specific locations such as educational institutions and hospitals. The question now is whether Ireland's move will set off a wave of comprehensive anti-smoking legislation. "Norway has already passed laws that will go into effect in July, and Sweden and Malta have plans to institute similar bans. In addition, the UK has indicated its intention to enact a ban of its own," said Nicogosian. In the developing world, total smoking bans are unlikely to appear any time soon, said Carmen Audera, a technical officer at WHO's Tobacco-Free Initiative. "There is a simple reason. Smoking arrived in developing countries relatively recently, and they have not yet begun to experience the mortality that starts three decades after the onset of an epidemic. That is why they are moving more slowly," she said.